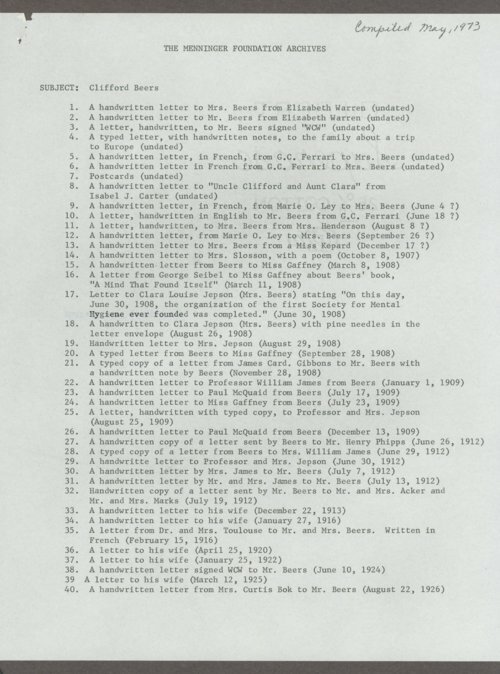 Beers' papers, largely, consist of handwritten and typed incoming and outgoing letters, as well as some correspondence about Beers. Correspondents include some family members, such as his wife Clara's parents and Clifford's brother George, but mostly include friends and acquaintances, such as Erua Geuil Perriu, Marie O.Ley, Paul "Mac" McQuaid, Elizabeth Warner, Louise Gaffney, Dr. and Mrs. Toulouse, Mary Louise Bok, William and Alice James, and others. The subjects of the letters mostly concern Beers' efforts toward bettering the lives of patients with mental illnesses and the publication of his book, A Mind that Found Itself. The materials also include Beers' courtship letters to Miss Jepson (parts of which were removed by Clara before she donated them to the Menninger Foundation, as she deemed them too personal) and letters he wrote to her after they were married. Some letters are in French. People - Notable People - Beers, Clifford W.